The Kid-Tough Portable DVD Player is the first portable DVD player that is rough, tough and easy enough for even the most rambunctious kids. Designed with special Kid-Tough features, this durable device will survive drop after drop after drop. 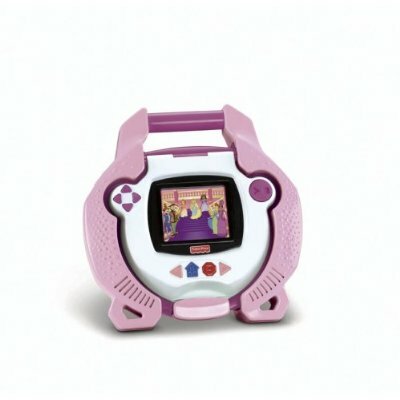 It has a 3.2″ color TFT screen, rechargeable batteries (with a two-hour life), battery charger/wall power unit, sturdy dual-rail DVD drive and a digital anti-skip buffer for the ultimate Kid-Tough viewing experience. Other great features include dual-grip handles, kid-friendly DVD door and DVD controls, CD-playback capability, handle for portability, kick stand legs for hands free viewing, video-out jack and headphone jack. Requires four “AA” batteries, included. Measures 8.5″L x 2.25″W x 9″H.